The Board of Directors of DCB Bank Ltd. (BSE: 532772; NSE: DCB) at its meeting in New Delhi on April 14, 2017, took on record the audited financial of the fourth quarter (Q4 FY 2017) and the year ended March 31, 2017 (FY 2017). 2017 was 34.9% as compared to 25.5% for FY 2016. 261 Cr. in FY 2016.
c) Operating Profit of INR 418 Cr. over INR 349 Cr. as compared to last year, an increase by 20%. d) The Bank earned Net Interest Income of INR 797 Cr. as against INR 620 Cr. for the same period as compared to last year, a growth rate of 29%. e) Non-Interest Income of INR 249 Cr. against INR 220 Cr. for the same period as compared to last year, an increase of 13%. March 31, 2016 a growth rate of 22%. 2017 from INR 10,950 Cr. as on March 31, 2016 a growth rate of 21%. Deposits (including Agri and Inclusive Banking) were 76.54% of Total Deposits. 31, 2016. Savings Accounts year on year growth rate of 36%. j) Net Interest Margin for FY 2017 stands at 4.04% as against 3.94% for FY 2016. 11.87%% and Tier II at 1.89% as per Basel III norms. INR 36 Cr (0.23% of Net Advances) comprising of 3 accounts. o) The Bank’s branch network increased to 262 branches as on March 31, 2017, an increase of 64 branches during the year. 70 Cr. in FY 2016.
c) Operating Profit of INR 115 Cr. over INR 97 Cr. as compared to last year, an increase by 19%. d) The Bank earned Net Interest Income of INR 220 Cr. as against INR 169 Cr. for the same period as compared to last year, a growth rate of 31%. e) Non-Interest Income of INR 64 Cr. against INR 61 Cr. for the same period as compared to last year, an increase of 3%. Speaking about the FY 17 performance Mr. Murali M. Natrajan, Managing Director & CEO said, “We have completed almost 70 percent of the 150 new branches roll out plan announced in October 2015. Our aim it to cross 300 + branches by December 2017. Business growth and momentum in Q4 2017 was better than Q3 2017. As of now NPAs remain in control we continue to remain watchful”. DCB Bank Limited is a modern emerging new generation private sector bank with 262 branches across 18 states and 2 union territories. It is a scheduled commercial bank regulated by the Reserve Bank of India. It is professionally managed and governed. 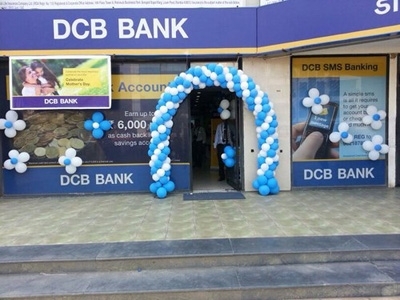 DCB Bank has contemporary technology and infrastructure, including state-of-the-art India’s first Aadhaar number & fingerprint based biometric ATMs, and internet banking for personal as well as business banking customers. The Bank has deep roots in India since its inception in 1930s. Its promoter and promoter group hold over 16% stake. The Bank’s business segments are Retail, micro-SMEs, SMEs, mid- Corporate, Microfinance Institutions (MFI), Agriculture, Commodities, Government, Public Sector, Indian Banks, Co-operative Banks and Non Banking Finance Companies (NBFC). DCB Bank has more than 6,00,000 active customers.